So, I purchased an LCD through Hacktronics, via Amazon. The LCD is no longer listed as available, but Hacktronics has other LCDs you can order through their site. The LCD comes with a set of pin headers as well as a resistor for the backlight LED. You need to solder the headers on yourself. The board is covered in solder resist, so this isn't actually very difficult. To use this LCD, which is controlled by a HD44780 LCD Controller, you'll need to either roll your own LCD library, or use this awesome library on codeplex. You can imagine which one I prefer. There are no official releases for that library, so you'll want to just download the source and add it to your project. The CodePlex project provides the LCD class, and the GPIO 4 and 8 bit implementations. There's also an implementation using a shift register to cut down on pin count, but I'm not there yet. I had a hard time with some initial wiring diagrams (ones that completely left out the backlight ??). I initially suspected my soldering, but luckily I have a brand spanking new BK Precision 2709B with a continuity meter. I tried to use the sample applications included in the codeplex project, but I got a really obscure error with the debugger, and was unable to deploy. It may have to do with mismatched versions of something, but I didn't have time tonight to dig in deeper. You can adjust the text color slightly by using the 10k pot. However, it has a very limited range. You can find information on the supported character set for the HD44780 here. Apparently, you can also create your own characters sets. So, that's it. I can't really explain in a blog post just how gratifying it is to write microcontroller code in .NET, and see results in something that is not being driven by a regular old computer. Seriously, it's super cool. Source code is included below. Oh, and yes, I used "LCD Display". I'll go enter my PIN number in the ATM Machine now. Oh, it's ON now. Alhough I think I get some credit for the SpaceOrb joint. Now I gotta figure out how I can possibly compete with "Hello World." I'm glad that you found my LCD library useful. It's still not 100% complete thus no releases on CodePlex yet. Let me know if you have any suggestions on how I can improve it. Btw. You are right about the backlight pin. I forgot to implement this in the GPIO provider. I will fix this soon. 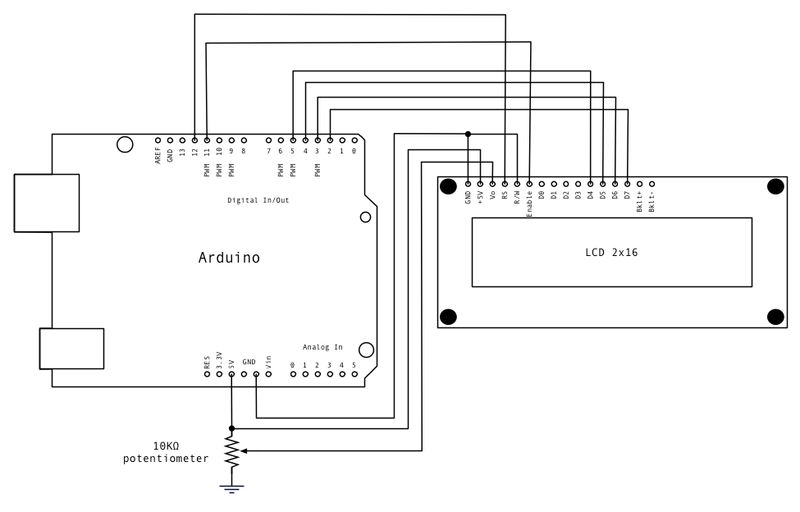 But another option is to connect it to one of the PWM pins on Netduino so that you can control LCD brightness from code too. Noticed one more thing. Your display is 4x20 so instead of lcd.Begin(16, 4) you should use lcd.Begin(20, 4) . Please let me know if this works and you can write to entire display. Ahh, thanks! I changed hte rows but forgot to change the column count. Awesome library. Thanks for putting that out there for the community. It's very instructive and comprehensive. Thanks for the tutorial, and I'm up and running thanks to your help. I have a question about using a thermocouple with the max6675 amplifier with the above code, but I can't find any resource for the max6675 library on Netduino. Do you have a temp sensor that you have used with the N+? I have a few questions. I'm new at this... very new. I've followed your diagram as best as I could but I think I have something wrong. I've wired the LCD as you show above but with a couple of minor exceptions. I do not have a potentiometer so PIN 3 is wired nowhere. Also, I do not seem to be able to get my resistor to work that came with the LCD so I wired pin 15 directly to the 5V pin. The results seem to be that the LCD lights up but nothing prints on the screen when I run the App. Is it a necessity to have a potentiometer? I assumed it wasn't because there isn't one in any of the arduino examples but as I said, I'm very new to this. Any recommendations? It has been a while since I wrote this, but the potentiometer was to set the operating voltage. You had to tweak that to get characters to display. Once you found the right setting, you could either leave it there, or replace it with an equivalent resistor. It's required to make the display work as I recall. Turn this off and go get a resistor so you don't burn out the backlight LED. That resister to 5V is to control the brightness of the backlight and make sure you don't burn it out. if I have accidentalyy connected GND to 5V and VDD to VSS, have I destroyed LCD display ? I can't say for sure, but it is likely that you destroyed at least the backlight, if not the whole display by connecting ground to +5V. If you want to use this library with a 4x16 LCD you must change the third and the fourth elements of RowOffsets to 0x10 and 0x50. We define size of display in Begin method but not used defined parameters for caluclated address. Instead we using RowOffsets array. The same error is in the original Arduino library. I was currious if it was the same as what you were using. For some reason last night I connected everything the way you showed above but I am not getting anything to display. I was able to get the dispay to work under I2C mode but not under SPI. I figured it out. You have to pull the R/W Pin 5 on the LCD to ground. And then everything works nicely. So, I've tried wiring this up exactly as specified. I have a 20x4 and it shows a row of 20 blocks on row 1 and row 3. I am not seeing any text. I've tried setting this up a few different ways and it always shows like this. The backlight and text colors are nice, I know I have that (hooked up to a pot, so I know it's good). I have no idea why I'm not getting no next, I hope you do. Im trying to get it working with 16x4 display WINSTAR WH1604E-NYG-JW with RW1067 controller chip. Im using 4-bit parallel communication and my result is like something adds one pixel before each character. Do you face such that behavior?